Mumbai, Dec 12 (IANS) Top Indian and international personalities, film and sports icons, business tycoons, political heavyweights, celebrities and a host of others attended what was described as "a royal wedding" for the scions of two top business conglomerates - Isha Ambani and Anand Piramal - here on Wednesday. The celebrations started in the afternoon with the traditionally attired groom, Anand, arriving on a mare at the head of a wedding procession (baraat) at the Ambani's towering Antilia residence. The 27-storied Antilia, said to be one of the most expensive private residences in the world, itself has been decked up like a bride, and the entire stretch from the main road to the building has been decorated since the past few days with multi-hued fresh flowers, colourful lights and festoons to commemorate one of the most anticipated weddings in the country's commercial capital in recent times. 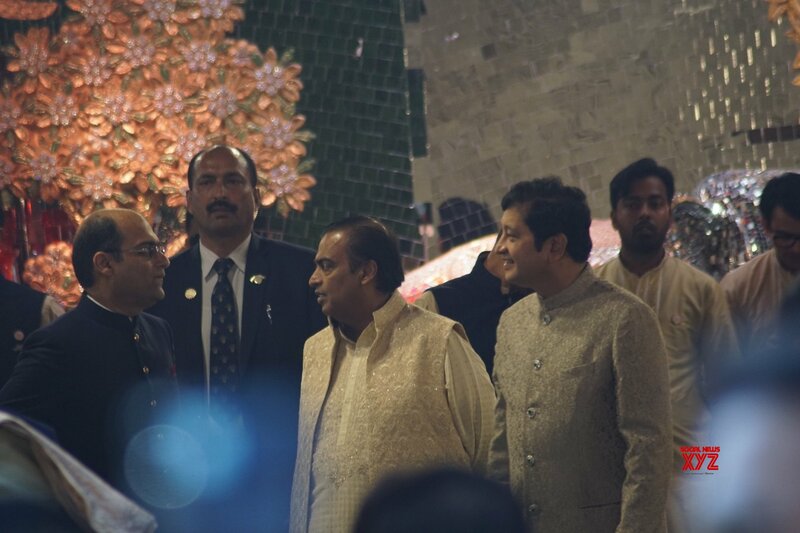 Later in the evening, the grand wedding saw the parents - industrialist Mukesh Ambani and his wife Nita, tycoons Ajay Piramal and his wife Swati - and others welcoming the high-profile celebrity guests. Former President Pranab Mukherjee was warmly received by business magnate Anil Ambani, the bride's uncle, while other top celebs like former US Secretary of State Hillary Clinton and Praful Patel also made their presence felt. Prominent invitees included Bollywood actors like Rajinikanth, Amitabh and Jaya Bachchan, Abhishek and Aishwarya Bachchan, Aamir Khan and Kiran, Shah Rukh Khan and Gauri, Salman Khan, Katrina Kaif, Priyanka Chopra and her husband Nick Jonas, Deepika Padukone and Ranveer Singh, Hritik Roshan, Shilpa Shetty and Vidhu Vinod Chopra et al. Besides, Sachin Tendulkar and other sports personalities, top business honchos included K.V. Kamath, Sanjiv Goenka, Deepak Parekh, Sashi and Anshuman Ruia, Adi Godej, Rahul Bajaj and Harsh Mariwala were also seen at the wedding. The grand wedding festivities had started several days earlier in Udaipur, Rajasthan which witnessed a performance by Grammy award winning singer Beyonce Knowles, a four-day special 'Anna Seva' and an expo on traditional Indian handicrafts, besides other events for the guests that included many of the biggest names from politics, business and Bollywood.